The University District (commonly, the U District) is a neighborhood in Seattle, Washington, so named because the main campus of the University of Washington (UW) is located there. The UW moved in two years after the area was annexed to Seattle, while much of the area was still clear cut forest or stump farmland. The district of neighborhoods grew with the university to become a microcosm of urban American cities. This is the area of the University of Washington - Seattle, which is the largest and most important university in Washington. The area around it is typical urban college area with crappy apartments, cheap food, cheep bars, and such. There is a very large Greek Row area which can get very rowdy, and even had a riot in recent years. 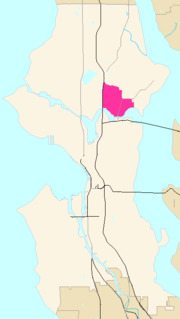 Like all Seattle districts, the boundaries of the University District are informal; by common usage, the University District is bounded on the west by Interstate 5; on the east by 25th Avenue NE; on the south by the Lake Washington Ship Canal; and on the north by NE Ravenna Boulevard. It also includes, east of these boundaries, a small district on the north shore of Union Bay, bounded on the north by NE 45th Street and on the east by 35th Avenue NE. This extension consists mainly of the "east campus" and extensive parking lots of the University. Its main commercial street, University Way NE, is known throughout the city as "The Ave" in the "U District". Some parts of the University District have had names of their own. For example, today "University Heights" mainly designates a former school used as a community center; a 1905 map shows the name as applying specifically to the area bounded by what are now NE 45th Street to the south, NE 55th Street to the north, Brooklyn Avenue NE to the west, and 15th Avenue NE to the east. What is now the University District has been inhabited since the end of the last glacial period (c. 8,000 B.C.E.—10,000 years ago). Prominent Native American Duwamish villages of the Lushootseed (Skagit-Nisqually) Coast Salish nations were on a then-larger Portage Bay at what is now called Brooklyn Avenue, and the other on a larger Union Bay, near the present UW power plant (which is across from the UW IMA building), around the north shores a mile farther than today, and shores east of what is now the Union Bay Natural Area. (See also adjacent Ravenna neighborhood.) The Duwamish, ("People of the Inside") tribe had the prominent village of SWAH-tsoo-gweel ("portage") on then-adjacent Union Bay, and what is now Ravenna was their backyard before the arrival of European settlers. Villages were diffuse. In spring, people dispersed from their winter villages of longhouses to camps, gathering in summer for salmon. Gaps in the forest were maintained to encourage game and food supplies. Such "prairies" (anthrogenic grasslands) were cultivated in what is now the University District. They were connected by a well-travelled path along what is now the Lake Washington Ship Canal (1883, 1916). Surveyors noted several large Douglas-firs and western red cedars (given that large trees were not unusual back then, these must have been especially large). The U. District was first surveyed in 1855, and its first white settlers arrived 12 years later. In 1890, that part of the neighborhood due west of the present UW campus was laid out as the Brooklyn Addition. One year later much of the land north of the Ship Canal, including Brooklyn, was annexed to Seattle. The UW moved from Downtown in 1893, and the first university building was built in 1895. An 1894 report describes a train wreck just west of the current University District. Latona has now been cut off from the University by Interstate 5. August 20, 1894. Wreck on [the] Seattle, Lake Shore and Eastern just west of Latone [now Latona Avenue]. Freight train from Gilman [now Snoqualmie] hit a cow. [Trainload was a] [m]ixer freight train, 10 co[a]l cars, logs and box cars. Train had slowed down at Brooklyn [Avenue] for cows. Engineer saw cows on a bank beyond Latona looking (?) one another[!]. One cow was tossed over [the] bank and hit the track just as [the] engine came by. [The] [e]ngine was raised off the track[,] and when it came down [the] wheels went off the rails. Engineer reversed but [it] was too late. [The] [c]oal tender shot ahead[,] tearing part of [the engine] car [(cab)] off and decapitating [the] fireman and killing [the] brakeman. Engineer and coal passer [were] unhurt. Steam and dust enveloped the derailed cars. Engineer ran to Fremont to telegraph to stop [the] evening passenger train[;] also [illegible] Engineer claimed train going 20 miles per hr. The name "Brooklyn" began to fade soon thereafter. Electric trolley tracks had been laid up Columbus Avenue (later 14th Avenue) in 1892, and the neighborhood soon began to be called "University Station" after the heated waiting house at the corner of what is now NE 42nd Street (1895). The name Brooklyn is not lost, however, for Brooklyn Avenue NE runs parallel to University Way, one block west. North and west of the campus, within the University District, the University Heights—a name now little used—was named for its elementary school (1903–c.1988; since 1990 the University Heights Center for the Community, host for numerous activities small and large. This 1980s sign painted on the side of the 1934 Blue Moon Tavern commemorates its association with the counterculture of the 1960s; the small street sign at upper right declares the alley to be "Roethke Mews" after poet Theodore Roethke, a regular at the tavern when he was a professor at the University in the 1950s and early 1960s. But for the trolley, in early decades of the U. District Downtown was a trek, a boat, and a horsecart ride away. Given these early transportation difficulties, the U. District was largely self-sufficient, with area businesses for people with ties to the University. Construction of family homes increased in the early 1900s, as did churches, theaters, stores, and a YMCA. The district's first bank and the first local public library opened in 1906, the modest library organized by local merchants. As a result of a contest held by the University Commercial Club in 1919, 14th Avenue (by then already known as "The Avenue" or "The Ave") was renamed University Way, and the neighborhood was renamed the University District (1919). The neighborhood's north-south arterials are (from west to east) Roosevelt Way NE (southbound)), 11th Avenue NE (northbound), Brooklyn Avenue NE, University Way NE, and 15th Avenue NE. NE Pacific, 45th, and part of 50th streets are principal east-west arterials, NE Campus Parkway is a minor east-west arterial, running only west of the campus. The U District is characterized by the indigenous annual May U District Street Fair, first of its kind in 1971, started by local merchant and dedicated peace activist Andy Shiga in 1970, and the University District Farmers Market, Seattle's first (1993) and largest local farmers-only neighborhood market. Andy Shiga (1919-1993) of Shiga's Imports and local attorney Calmar McCune (1911-1996) long supported development of the alternative character of the U District. The ASUW Experimental College, founded in the college culture of 1968 by a group of UW students seeking education in areas not found in the traditional university environment, is now the largest nonprofit student-run program of its kind. Open to all, it has contributed to the cultural ambience of the U District ever since. The Blue Moon Tavern has become an unofficial cultural landmark, since 1934. Big Time is Seattle's original brewpub (1988). Six theatres (including the Neptune built in 1921, the Varsity since 1940; the Grand Illusion Cinema (founded in a former dental lab in 1968 by Randy Finley, now owned and run by dedicated volunteers); and the (locally-owned) Scarecrow Video, the largest video store on the West Coast further characterize the neighborhood. The U District is second only to Capitol Hill as an epicenter for NoCat Free Wi-Fi with the global Seattle Wireless project. The neighborhood's skyline landmarks (other than the UW campus) are its tallest buildings: UW Tower (formerly Safeco Plaza) and the Meany Hotel (which became the Best Western University Tower and is now known as Hotel Deca). The former, originally headquarters of Safeco Corporation, is located at the corner of Brooklyn Avenue NE and NE 45th Street. It was built in 1973, and at 22 stories high is the city's tallest building outside Downtown. The latter is Art Deco (1931, restored). The architect Robert Reamer gave every room a corner window. A jewel of the neighborhood is the formal Neo-classical Carnegie Library (1910) on Roosevelt Way at 50th Street. The U-District, looking northeast from Queen Anne. UW Tower is the tall building in the center, with the Hotel Deca (originally the Meany Hotel) to its left. The Interstate 5 Ship Canal Bridge is in the foreground. In recent decades, the University District has suffered commercial decline, due at least in significant part to the more competitive planning, capital investment, and popularity of the University Village shopping center east of the campus, and Northgate Mall about 1-1/2 miles (2-1/2 km) north beside I-5. From 2002 to 2004, the city and the neighborhood have made some steps countering this trend by giving the Ave a repaving facelift including the addition of benches, bus bulbs, and period lighting. The addition of benches represented the reversal of a decades-long neighborhood trend away from providing free places to sit. Starting in 2016, the district will be serviced by an extension of Link Light Rail called the University Link. The light rail line will connect the U District with Capitol Hill, Downtown Seattle, Rainier Valley, and Sea-Tac airport. There are currently plans for one station located on Montlake Boulevard in front of Husky Stadium and another on Brooklyn. The local year-round and seasonal homeless population, referred to as "Ave Rats", is well-known around Seattle. Due to the size of the UW Greek system, fraternity and sorority members make up a sizeable portion of the local cafes' and bars' clientele, especially such establishments as Earl's and Fourno's, though well outnumbered by the Seattle campus student body of more than 39,250. Other bars have a wider base of patrons, including the College Inn (built for the Alaska-Yukon Exposition in 1909) and the Irish Emigrant. The University District is home to all of the UW's fraternity and sorority houses, most of them clustered along 17th Avenue NE between NE 45th and 50th Streets ("Frat Row" or "Greek Row"). On Thursday (when many Greek parties are held to deter high-schoolers) and Friday nights, it is not uncommon for parties to spill out into the local streets within the area. This reputation draws many crashers, and most of the recent instances of gun violence, injury, and property damage at UW student parties have been due to party crashers getting ejected, in the context of readily available alcohol (and recreational drugs) at large student parties. The information presented here was gained from Wikipedia.